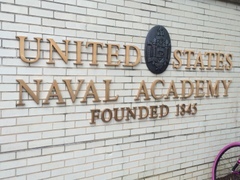 One of the things I wanted to see was the U. S. Naval Academy in Annapolis. Matt wasn’t interested because he had visited there and actually applied there (he ended up in the Corps of Cadets at VA Tech). We took the boys’ good friend from the marina, Zach. The boy is ten and an absolute fount of historical knowledge. The tour guide is amazed and shoots me an impressed look. Although I’m dying to give a no-big-deal shrug and take the credit, I shake my head, point at myself and then at the two monkeys hanging on the fence. Zach’s mom is clearly a ‘real’ homeschool teacher. New plebes being marched around. We see a cool video of what life is like as a cadet (very impressive but not one I’d like … all the rules! 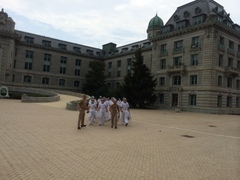 ), a set of new plebes being whipped into shape, a tour of the campus including the beautiful chapel with a naval hero buried in the crypt below, and a museum with ships carved from fish and whale bone. 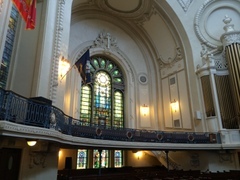 The chapel at the US Naval Academy. This entry was posted in Uncategorized on July 17, 2014 by Diane.